Tom Ndayishimiye currently works as a Behavior Support Specialist for English Language Learners (ELL) in the Boise Schools District. His education, professional work and personal experience makes him valuable asset for the students he works with locally. Tom has a unique perspective and strong capacity for helping local refugee students as they maneuver through the frustrations of adapting to a new and confusing culture because he has had to find his own way as a refugee from Congo. As a young man, Tom acquired a Bachelor’s degree in Education from Kigali Institute of Education in Kigali, Rwanda. After graduation, he became a teacher of history and geography, and later a District Education Officer in D.R. Congo. In that role, he implemented national curriculum, coordinated education for 100 public and private schools, and recruited and trained principals and teachers in successful school and classroom management. He also participated in the development and implementation of primary free education across the D.R Congo. When political unrest escalated into war, the Ndayishimiye family had to flee to Kenya where Tom found a position as a social worker for refugees in Nairobi with a non- profit organization, The Tushirikiane Africa (TUSA) Charitable Trust. He also worked as a French teacher. 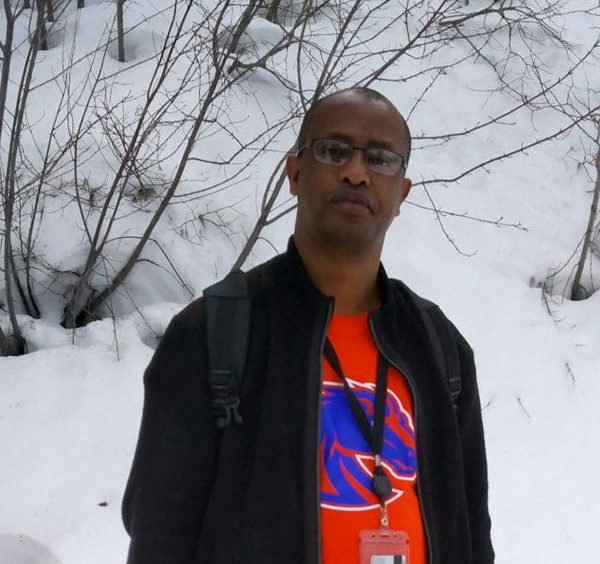 While Kenya offered political stability, it did not offer refugees a path to citizenship, and lack of citizenship barred Tom from pursuing his professional career. Consequently he turned the Agency for New Americans who offered his family the chance to settle in Boise, Idaho. ANA helped the family get settled in the city and Boiseans Ryan and Kate McFarland volunteered to become mentors for Tom and his family. Upon learning of Tom’s professional background and his proficiency in six languages, Kate referred him to Global Talent Idaho, anticipating they could help him find work as a translator and perhaps something in his chosen field. There he met Gina Finley, Global Talent Idaho’s Program Manager, working to help refugees find their way back into their respective careers. GTI provided Tom the opportunity take classes to enhance his computer skills and provided training in resume development, networking, and interview skills. GTI’s close relationship with the Idaho Department of Labor and the Boise School District resulted in Tom’s first professional job in the U.S. as an ELL Behavioral Specialist with the Bridge Program in the Boise School District. Tom, who intends to become a U. S. citizen, anticipates acquiring an advanced degree in Global Affairs and Human Security or in Public Policy. His hope is to position himself appropriately in a helping profession what will allow him to positively affect the lives of many.